Getting a pet dog, especially if you’re new to canine companions, can easily be one of the best and most exciting things you can ever experience. However, bringing your new pet home can be complicated, especially if you already have a cat in your family. To help you with this tricky situation, we’ve put together a list of tips that should aid in smoothing things over with your feline family member. Let’s assume that, for all intents and purposes, you have yet to pick a dog to bring home with you. In this instance, it’s important to consider the personality of your cat in your choosing of a new furry companion. For instance, if you choose an excitable dog, one that can’t seem to sit still or loves to chase things, then introducing them to a shy and fearful cat might be a recipe for disaster. The reverse is also true—if you have a timid dog for a new companion and you’ve seen your cat swat or growl angrily at dogs, then you might have some difficulties in introducing them to each other. The key here is to pick a dog that compliments your cat’s personality. If your cat is the calm and confident sort, then they most likely would do well with an excitable dog or pup. Conversely, if your feline is the sort to be curious and playful, then an equally-rambunctious but gentle dog would probably do nicely in keeping the peace during their first meeting. Let’s say you did manage to pick a dog that compliments your cat’s personality, or perhaps there’s just a tiny chance of tension between them. Whatever the case, it’s a good idea to make sure that there is something that prevents them from coming into contact with each other during their first meeting – both for their safety and yours. Ensure that your dog is wearing a durable, well-made dog collar with an equally-strong leash. If they’re too small for one, you can put them in their crate instead. As for your cat, you can let them roam free and check out your new pet from a distance. If they’re more of a shy or panicky personality, then you can put them in their carrier and let your leashed dog get familiarized with the sight and smell of your cat. Reward them liberally with treats in this period, especially if they behave, cementing in them the idea that the presence of the other is a positive experience for them. If your dog starts barking at your cat, that’s fine, just make sure you have a hold on their leash as you calm him down. 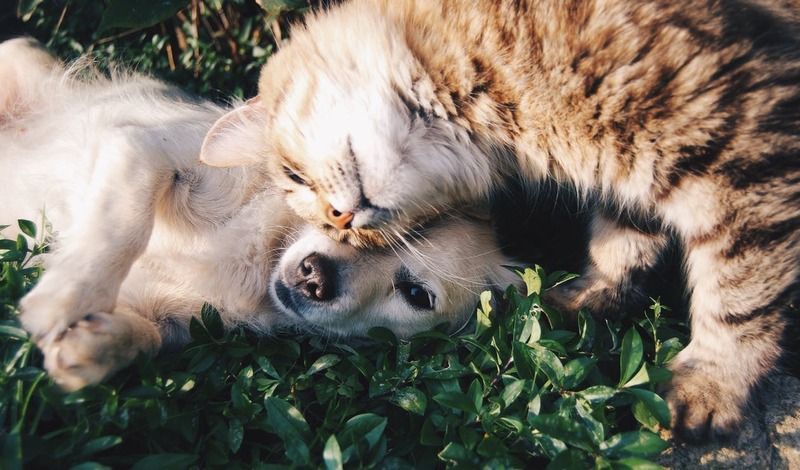 If your cat hisses at your dog or raises their hackles at the sight of them, that’s normal too, but make sure that they are unable to actually make contact with your dog while they’re in an agitated state, as this could result in injury. Do these supervised meetings multiple times in a day, over a period of days, until your pets cease acting out at the presence of each other. Then and only then can you move to the next step of getting your new dog to acquaint themselves with your cat. Now comes the hardest part: removing the barriers that protect your two pets from each other. Again, only attempt this if you’ve had multiple sessions of success with the previous step. Start this off by feeding both your dog and cat their meals for the day. Wait for them to finish their meals so that they’re more relaxed, and then bring them both into a common area in the house. Take your dog off their leash, let your cat free from their carrier, and then just watch them interact with each other. If trouble starts to rear its ugly head and neither treats nor verbal commands can get them to calm down, then separate your two pets and go back to the previous step. After a few additional successful sessions in a row, try this step again, giving them more and more free time with each other with every attempt. One thing to remember here is to always give your cat an escape route. Never let them feel cornered. Give them places to jump up to or climb for safety, such as a cat tower or a scratching pole. Make sure to never let them out of your sight either, as an all-out fight between both pets could result in grievous injury to either party. Finally, don’t let them eat in the same place before they’re used to each other, as a dog’s natural sense of curiosity will tempt him to sniff around the cat’s food, and this could be perceived by your feline as a threat to its food source. Keep doing these unrestrained meetings more and more, and soon enough, your two pets will become the best of friends – or at least, something approaching a mutual understanding. Sometimes, we don’t have the luxury of choosing the pets we want – our pets choose us, and to try to give them back to the pet shop or pound may just be a concept too heartbreaking to even consider. As such, if you’ve tried everything and your pets are still being uncooperative with each other, then you may need to have a professional involved. This may cost a bit more, but it’s ultimately for the best, as both your pets deserve to enjoy life without having to deal with a constant source of stress (and danger) in their forever home.